As befits a Korean male raised in the militarist Japanese Imperial tradition in Manchukuo, who then came to power in Seoul via a military coup, Park Chung-hee has a mixed legacy across the generations of South Koreans. Older groups credit him primarily with overseeing a process of economic development that raised the country’s standard of living, while others, many drawn from the 386 Generation of democratization activists, abhor his record on human rights and civil liberties. In the end, though, a holistic appraisal demands that we transcend Park’s dichotomous and ultimately rather limited reputation as either saint or thug, and look towards the tools he exploited to his enormous advantage over 18 tumultuous years at the pinnacle of power in the young South Korean state. In this regard, one of the least-explored aspects of Park’s politics was his ability to marshal popular support for his initiatives. In a brand new essay for Sino-NK that draws upon scholarly works from Korean researchers, Yenching Scholar and MA candidate at the Yenching Academy of Peking University (and a former Fulbright research fellow at Yanbian University in Yanji) Megan Cansfield provides readers with some intriguing insights into the connection between Park’s push for industrialization and the formation of a specifically South Korean national identity. — Christopher Green, Senior Editor. Reconstructing the Citizen Identity | Park Chung-hee saw modernizing Korea’s economy and establishing industrial infrastructure as the core of his self-given mandate for developing the post-Korean War economy. But he also seems acutely aware that his success in these measures – and by extension the foundations of his own political legitimacy – would depend on the state’s ability to co-opt the masses into its reform efforts. In his 1971 book To Build a Nation, Park himself acknowledged the psychological elements of his economic reform goals. Park stated, “This task requires not only strong national willpower but also the ability to translate willpower into achievement…If people have a sympathetic understanding of a task, they will voluntarily participate in it.”1)Chung-Hee Park, To Build a Nation, 1971. Excerpts from Sources of Korean Tradition, ed. Yong‐ho Ch’oe, Peter H. Lee, and Wm. Theodore de Bary, vol. 2 (New York: Columbia University Press, 2000), 396. Park recognized the importance of civilian support in implementing his reform measures through ideological mobilization amid economic restructuring. Simply coercing people with promises of greater financial security alone would have been insufficient for retaining their approval without justifying the infringements on civil and political rights under Park’s authoritarian rule as necessary sacrifices.2)Sang-sok Mun, Mechanism of Mass Mobilization and Creating State Citizens During the Economic Development Period. (Austin, TX: University of Texas Libraries, 2008), 12. Integrating these ideological components enabled Park to build links between the personal and the political, attempting to infuse a mass sense of Korean national identity.3)Park, To Build a Nation, 396-398. Nationalism laid the foundations for acceptance of governmental measures even for citizens sidelined by Park’s unequal development initiatives, which concentrated investment and resources heavily in industrialized urban regions and in the hands of state-approved chaebol conglomerate companies.4)Eun Mee Kim and Gil-Sung Park, “The Chaebol,” in The Park Chung Hee Era: The Transformation of South Korea, ed. Byung-Kook Kim and Ezra F. Vogel (Boston, MA: Harvard University Press, 2011), 265. In this way, constructing a development-first narrative intertwined with rhetoric of collective Korean national will strengthened Park’s claims to have the national interest in mind when prioritizing growth over democratic outcomes. Mass Dictatorship and Popular Support | The contentious notion of citizen complicity with Park’s repressive authoritarian state has since been reinterpreted by prominent Korean historians and scholars in terms of its connection to to the Korean sociocultural context. Namhee Lee notably characterizes Park’s Korea as a “Mass Dictatorship” configuration, where a dictator maintains popular support from below, a support which is concentrated in the cultural sphere rather than institutional structures. Lee says the Park regime’s ability to diffuse state power into the sphere of the individual with its rhetoric linking Korean identity to development “[made] it possible for the state to construct the image of a people with unitary will and action and to have them behave according to this image.”5)Namhee Lee, “The Theory of Mass Dictatorship: A Re-examination of the Park Chung Hee Period,” The Review of Korean Studies, vol. 12, no. 3 (2009), 45. Lee thus affirms the role that culturalist rhetoric played in merging public opinion with the government agenda. Indeed, Park invoked nationalist sentiments in his description of the modernization efforts in the 1962 Treatise following his seizure of power: “The revolution…was a new, mature national debut of spirit….it is to revive our people, reconstruct our nation and reform us. 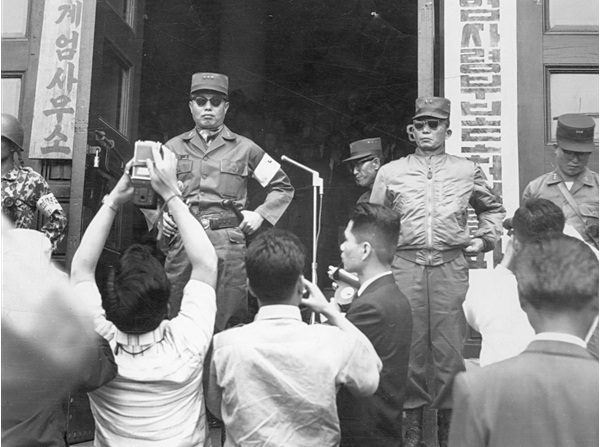 This is a revolution of national reform.”6)Chung-Hee Park, “1962 Treatise” in The Country, The Revolution and I. (Seoul: Hollym Corp., 1970), 22-23. Positioning himself as a leader working towards the Korean people’s common interest by fostering a national resurgence with economic growth initiatives, Park sought to paint himself in a more amiable light. In turn, Park’s appeals to cultural collectivism and Korean nationalism offset his more controversial claims that the democratic infringements and rights violations during his rule were a necessary evil for development and a small sacrifice to individuals to pay for renewed national strength. Shifting State-Citizen Relations | The Park regime’s efforts to leverage values among people gave rise to a new way of conceptualizing state-citizen relations in the Korean developmental state, a conception which has been analyzed by many Korean scholars of the Park era. Sang-sok Mun writes of “the emergence of a national subject under Park”, while Hwang Byeong-ju claims the Park modernization drive simultaneously represents “expansion of capitalism and construction of national subjectivity.”7)Mun, Mechanism of Mass Mobilization, 12; Byeong-ju Hwang, “The Ruling Discourse and Mass Politics of the Park Chung Hee Regime,” The Review of Korean Studies, vol. 12, no. 3 (2009), 23. The Park regime’s portrayal of the people as a collective entity both benefiting from and contributing to the industrialization process also served to link the concepts of ‘Korean citizens’ and ‘subjects of the state.’ Cultivating popular belief in this paradigm therefore gave Park a ready-made ideological framework in which it was easier for him to legitimate his dictatorship by positioning himself as the evident leader to direct national development on behalf of the subjected masses. In such circumstances, the ideals and realities of state-society connections were blurred, facilitating receptiveness to Park’s dictatorship at a psychological and sociocultural level.8)Jie-Hyun Lim, “Historiographical Perspectives on ‘Mass Dictatorship,’” Totalitarian Movements and Political Religions, vol. 6, no. 3 (2005), 329. This source of support and cooperation first for his leadership and then for his policy agenda stands in opposition to the dominant narrative of Park’s economic development initiatives as being the primary basis for secondary popular approval of his leadership, demonstrating instead the key role of ideological consensus and identity politics as the precursor to the economic growth that prompted mass support for Park during his rule in the 1960s and 1970s. “Park Chung-hee Syndrome” in Modern Memory | In fact, the developmental mindset and identity constructs of the Park era continue to be influential in modern-day Korea, as evidenced by the resurgence of positive reminiscences about Park in recent years. The unexpected rise of “Park Chung-hee Syndrome”, as the phenomenon is collectively known, began in the aftermath of the 1997 Asian Financial Crisis when Korea’s economy crashed and many longed for the days of reliable economic growth and optimistic certainty for Korea’s future under the developmental state. 75.9% of respondents in the Korean newspaper Dong-A Ilbo’s survey that year chose Park as the most competent president in Korean history, compared to only 3.7% choosing then-president Kim Young Sam.9)Doowon Suh, “Democracy Disenchanted and Autocracy Glamorized in Korea,” International Journal of Social Science Studies 3, no. 6 (2015): 1-11; Seungsook Moon, “The Cultural Politics of Remembering Park Chung Hee,” The Asia-Pacific Journal: Japan Focus 7, no. 5 (2009), 1-32. More recent assessments also echo this public sentiment consistently across various temporal contexts and political climates: in the 2010 Korea Democracy Barometer survey, 34.9% of respondents selected Park’s government as the best after the 1960s, while a 2015 Gallup Korea poll showed 44% of respondents naming Park as the best president since South Korea’s independence from Japanese colonial rule in 1945.10)Woojin Kang, “Democratic Performance and Park Chung-hee Nostalgia in Korean Democracy,” Asian Perspective 40 (2016): 51-78; “Park Chung-hee the best leader since 1945: poll,” Yonhap News Agency, August 7 2015. The high degree of contemporary endorsement for Park Chung-hee is controversial because Korea’s democratization and shift away from the developmental state economic model since the Park regime have heightened public concern for values such as democratic processes and human rights, which were unambiguously flouted under Park’s presidency and framed as fundamentally incompatible with the demands of development. Having such a high percentage of survey respondents disregarding his shortcomings by positively rating Park indicates that although Korean society’s values have changed, the people have not necessarily lost Park’s propensity to prioritize development. Given the degree of interconnection Park cultivated between his developmentalist agenda and the concept of Korean national identity, this phenomenon speaks to Park’s success in molding the Korean people’s enduring self-conceptualization in order to foster closer popular association of government approval with economic consensus. Although “Park Chung-hee Syndrome” was not limited to older Koreans exclusively, much of the surge of positive remembrance did come from the Baby Boomer generation, people born in the 1950s after the end of World War II and the Korean War.11)Kang, Park Chung-hee Nostalgia, 66. Baby Boomers’ political socialization took place as they grew up during the Park regime, signifying an extended process of internalizing Park’s ideals in their past; accordingly, researchers Kyoung Hee Ma and Hye-Kyung Kim discovered that these views have manifested among this demographic as a documented political preference for strong or authoritative leaders.12)Kyoung Hee Ma and Hye-Kyung Kim, “Collective Memory and Formation of the ‘Unconscious’ Political Generation: Focusing on the Former Period Baby Boomers in Korea,” Development and Society 44, no. 1 (2015), 93. This characteristic further demonstrates the lasting impact of the Park regime’s narratives in shaping modern-day conceptions of Korean national identity and support for the structure of a subjected citizenship under a powerful state, which helps facilitate a positive perception of Park in popular memory just as much now as it did then. With the political conservatism, nationalistic ideals, and developmentalist ethos of the 1960s making a comeback in contemporary Korean society, it is relevant now more than ever to critically reassess the Park Chung-hee regime and understand its underlying dynamics. Closer investigation of the Park regime’s public rhetoric and commonly-invoked ideals reveal a pattern of mass mobilization built on attempts to reframe public conceptualization of the links between individual, nation, and state. Park mostly succeeded in imposing these constructed identities onto the public, as evidenced by a certain level of citizen co-optation with the authoritarian regime and a positive portrayal in contemporary Korean public memory. Promoting a collective Korean identity and national will in line with Park’s developmental initiatives enabled public support for not only the regime’s policies but also for Park himself. In the context of Park Chung-hee’s regime, therefore, the state-sponsored ideological acculturation and identity politics surrounding the Korean nation and state-citizen relations were just as influential in mobilizing public support for the regime as economic developmentalism. In practice, these movements provided the essential conceptual framework and catalyst without which popular support for Park’s development state might not have taken hold in Korea, establishing their significance in Korea’s national history. 1. ↑ Chung-Hee Park, To Build a Nation, 1971. Excerpts from Sources of Korean Tradition, ed. Yong‐ho Ch’oe, Peter H. Lee, and Wm. Theodore de Bary, vol. 2 (New York: Columbia University Press, 2000), 396. 2. ↑ Sang-sok Mun, Mechanism of Mass Mobilization and Creating State Citizens During the Economic Development Period. (Austin, TX: University of Texas Libraries, 2008), 12. 3. ↑ Park, To Build a Nation, 396-398. 4. ↑ Eun Mee Kim and Gil-Sung Park, “The Chaebol,” in The Park Chung Hee Era: The Transformation of South Korea, ed. Byung-Kook Kim and Ezra F. Vogel (Boston, MA: Harvard University Press, 2011), 265. 5. ↑ Namhee Lee, “The Theory of Mass Dictatorship: A Re-examination of the Park Chung Hee Period,” The Review of Korean Studies, vol. 12, no. 3 (2009), 45. 6. ↑ Chung-Hee Park, “1962 Treatise” in The Country, The Revolution and I. (Seoul: Hollym Corp., 1970), 22-23. 7. ↑ Mun, Mechanism of Mass Mobilization, 12; Byeong-ju Hwang, “The Ruling Discourse and Mass Politics of the Park Chung Hee Regime,” The Review of Korean Studies, vol. 12, no. 3 (2009), 23. 8. ↑ Jie-Hyun Lim, “Historiographical Perspectives on ‘Mass Dictatorship,’” Totalitarian Movements and Political Religions, vol. 6, no. 3 (2005), 329. 9. ↑ Doowon Suh, “Democracy Disenchanted and Autocracy Glamorized in Korea,” International Journal of Social Science Studies 3, no. 6 (2015): 1-11; Seungsook Moon, “The Cultural Politics of Remembering Park Chung Hee,” The Asia-Pacific Journal: Japan Focus 7, no. 5 (2009), 1-32. 10. ↑ Woojin Kang, “Democratic Performance and Park Chung-hee Nostalgia in Korean Democracy,” Asian Perspective 40 (2016): 51-78; “Park Chung-hee the best leader since 1945: poll,” Yonhap News Agency, August 7 2015. 11. ↑ Kang, Park Chung-hee Nostalgia, 66. 12. ↑ Kyoung Hee Ma and Hye-Kyung Kim, “Collective Memory and Formation of the ‘Unconscious’ Political Generation: Focusing on the Former Period Baby Boomers in Korea,” Development and Society 44, no. 1 (2015), 93.